There is the process of growing of onions (lat. Állium cépa) at home in this graphic work. Individual bulbs were placed in a few glasses of water on the window in the room. 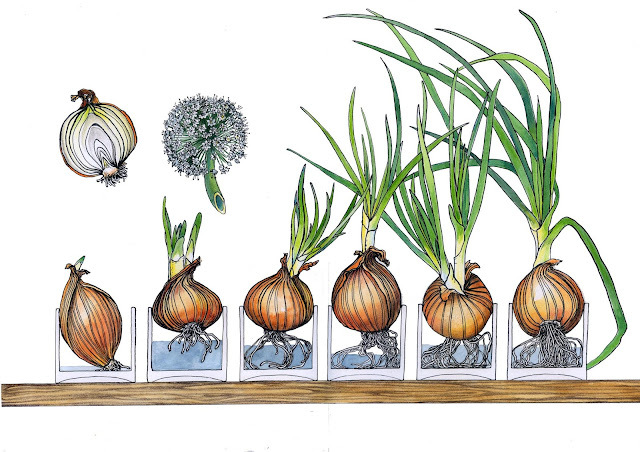 Time interval between the beginning of sprouting of bulbs is 5-7 days. The bulbs have sprouted in daylight and at room temperature. Onions sprouted in ordinary water without artificial activators of growth. In this work presents dynamics development of root and leaf of the bulb. The main condition of the quality of growth - a large amount of solar rays that fall on the plants. Here is also depicted a cut of the bulb before the beginning of sprouting and inflorescence of onions. There is the internal structure of the bulb on a cut. Color is depicted in accordance to the real color of the plant. There was conducted photofixation of germination process; this picture was made by using photos and direct observations of plants. Glasses in which were grown bulbs are shown conventionally, the main focus is on the detail of plants. Graphics was made using several graphic materials, watercolor paints, ink, colored pencils. This graphic composition can be used as a visual accompaniment (picture) to study of the plant world during a learning by pupils in school. The study of the development process of plants in artificial conditions is important in conditions of total global urbanization. watercolor paints, ink, colored pencils.